HOUSTON (AP) — Draymond Green isn’t apologizing for his part in a dustup with Kevin Durant that led to a one-game suspension by the Golden State Warriors. But Green vowed Thursday that the Warriors are not imploding, regardless of whatever is, or isn’t happening, following the heated exchange between he and Durant in Monday night’s overtime loss to the Los Angeles Clippers. The Warriors forward spoke on Thursday for the first time since the incident. He opened his session with reporters by saying: “I’m going to speak on this one time and one time only,” and refused to take any questions about it after he was done. 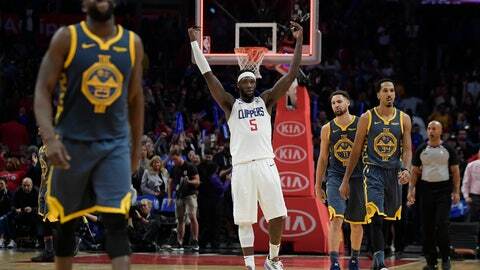 In the closing seconds of regulation during Monday’s 121-116 overtime loss on the road to the Clippers, Green secured a rebound and, with Durant calling for the ball, instead dribbled the length of the court into traffic and lost control as the Warriors failed to get a shot off. Durant was shown on camera visibly upset immediately afterward. It wasn’t the first time Durant and Green have been involved in a verbal altercation. In another overtime loss, 109-106 at Sacramento on Feb. 4, 2017, they shouted at each other and argued near the bench. “I can tell you that I am extremely confident in this team’s ability to get through any adversity,” he said. Kerr said he’s also talked to Green about the incident but that he wanted to keep what was said private. However, he did rave about Green and what he’s done for the Warriors in his seven seasons with the team. Green, 28, seemed amused by stories that have been written and sports commentators who have wondered if the discord between he and Durant will cause the former league MVP not to re-sign with the Warriors next year, or if it will ruin the team’s chances of winning its third straight title.